The recent DHFL bond fiasco has added to the list of factors that should be continuously monitored by an equity investor. Assume a company has issued bonds of Rs 10 lakhs each at a coupon rate of 9%. Typically the interest offered by corporates is at a premium to the rates offered by the government, which at the time of writing this article (22 Sep 18) are 8.2%. If the company’s financials are strong and it pays its interest on time, and if there is no adverse news around it, it’s coupon rate will fluctuate around 9% to 9.5% – say 10%. 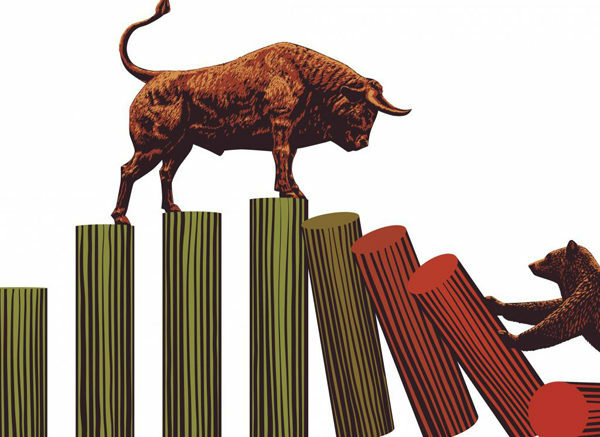 d. The economy has worsened and there are very few takers at the current bond yields and this has made the sellers desperate to unload and book losses. Suppose XYZ Ltd issues bonds of FV 100 with a coupon rate of 10%. This means that the bond buyer has invested Rs 100 per bond to earn an interest of Rs 10 per year. Later, the economy takes a dive and bond investors dump the bond at 13%. The investor too panics and sells out his bonds at 13%. This also implies that the investor lost Rs 23 on his investment, and that spells bad news. This is what happened to investors when they sold DHFL 9.10% bonds of FV 100 at 11%. Though it always makes sense to monitor bond yields, no one does it because we take our economy for granted. Anyway, the DHFL episode has taught us to be vigilant, which is better later than never. 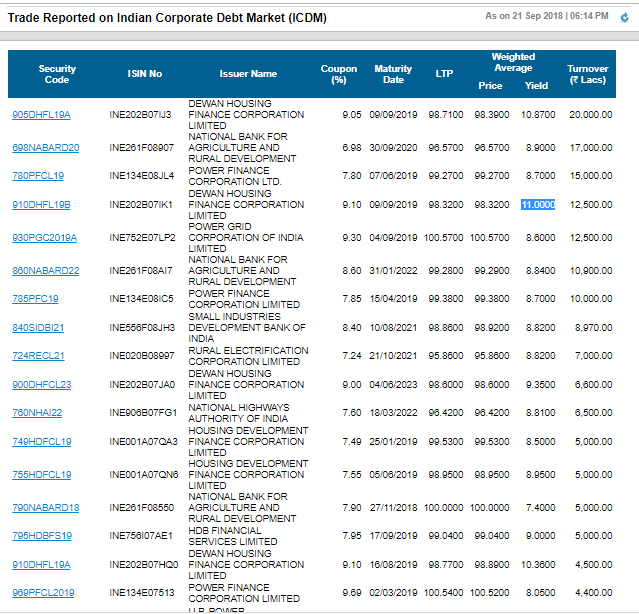 Now here’s how you access the daily trades in the Indian corporate debt market. Click on the link above to figure out the bond deals reported to BSE. 1. The Coupon rate – that is the original rate of interest on the bond. 2. The Weighted Average Yield. This is the yield at which the bond has been traded during the day. 3. The yield. If it is at a significant variation to the coupon rate, then something is up. Though the NSE site contains more OTC data than the BSE site, it is quite cumbersome to mine, because the information is not presented clearly and one must use Google to figure out which company’s bond yields are varying greatly with the coupon rate. The coupon rates too are not reported on the NSE website and so it makes it tougher to mine and analyze data. You will be able to figure out the coupon rate and the FV only after you Google the information and this makes the NSE bond market reportage very unfriendly, but a necessary page to visit for keen market analysts. This is what you have to do to keep tabs on rising, or falling, yields. 3 Comments on "How to Keep Tabs on the Indian Corporate Debt Market"
India has a great bond market where you can neither buy nor sell. Authorities have been sleeping over this for over a decade. 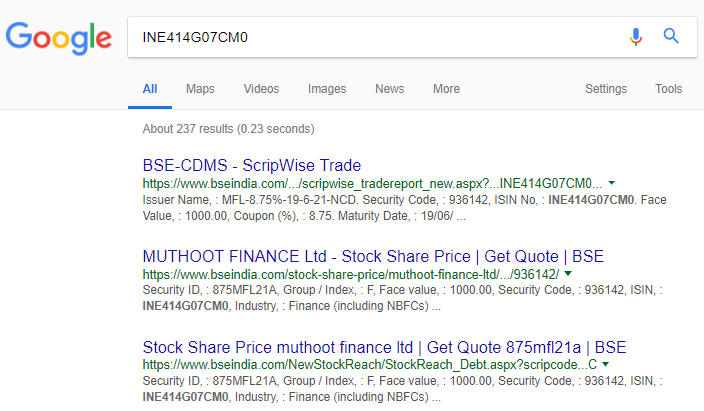 Info available on NSE is sketchy. For NSE bond is like a share of a joint stock company. Please share information on how to purchase the corporate debt bonds.